On the back roads of Madison County, a woman and her trusty bookmobile delivered a passion for reading to the area’s most remote residents. Madison County’s first public library was a 1947 Ford truck named “Bookie” that traveled slick, narrow mountain roads, barely more than footpaths. 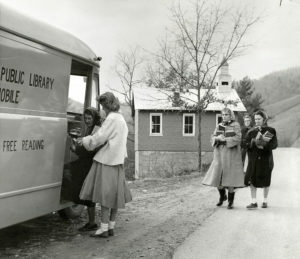 Despite a deep respect for education among locals, there was no county library when the bookmobile program launched in 1955. Books were heirlooms passed down from generation to generation, venerated but rarely read. Even schools didn’t always have libraries. But Hot Springs native and former schoolteacher Elizabeth Rumbough Baker Dotterer, better known as Peggy Dotterer, “The Bookmobile Lady,” was determined to bring a love for reading and a sense of community to those she served. From 1955 until her retirement in 1970, Dotterer carried news, companionship, and books to the families she met along her route. Places like “Miss Isensee’s Mail Box,” “Old Log Cabin,” Maynard’s Texaco Station, and Middle Laurel Church of God became gathering sites as residents set aside their chores when they heard the wheeze and grind of the lumbering vehicle making its way up the holler. “Here Comes the Bookmobile,” with its list of scheduled stops, became a weekly feature in the local paper. Electricity was starting to trickle into the county, and by 1950 there were three radio stations; Dotterer made sure that the bookmobile’s schedule was announced on all of them. The folks she’d find at home were usually women, charged with caring for children, homes, and gardens while their husbands worked long hours. Many husbands resented the time that reading might take from their wives’ chores; Dotterer learned which houses to avoid when the husband’s truck was parked in the yard. When a new bookmobile was finally purchased in November 1957, Dotterer recounted the “heart-to-heart” that she had with Bookie. Fortunately, the “old gal” took it well, and soon Bookie and “Bookie Too Dodge Universal Mobile” (wisely called “Bookie Too” for short) were “sitting there in the yard, chatting away so friendly-like.” Blue Cloud, the third and final bookmobile, was a bright blue walk-in that held 1,500 carefully selected volumes. Though much of Big Pine is only about a dozen miles from Marshall, the drive would have taken the better part of an hour back in 1950. Roads were usually unpaved, narrow, and steeply pitched between craggy precipices. Men might take the family car to work in town, but women’s lives largely revolved around the home. Books — and Dotterer’s newsy chatter — offered a sense of connection with the wider world. 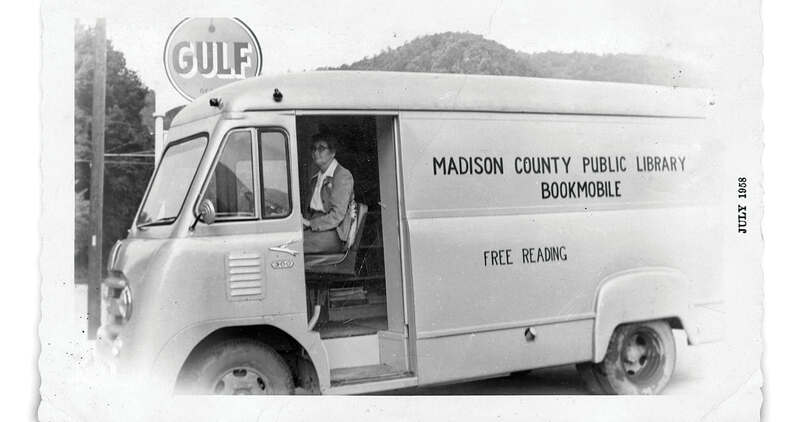 The bookmobile also strengthened the sense of community among residents from remote parts of Madison County. “You’d see who read what you’d read,” Goforth says, “and it would be a kind of connection with them.” But mountain people treasure their privacy; not everyone wanted to write their names in the books for all to see. “Some would have their marks, like a star or a check mark,” Goforth says. She recalls one man who loved to read romance novels. “He had his wife come pick them out for him,” she says, laughing. “Mrs. Dotterer was a good friend to all of us,” says musician Joe Penland, who also grew up getting books from the bookmobile. “I respected her tremendously. And if anybody was dedicated enough to risk running off in a ditch to take books out into the community, it was her. She was probably one of the top 10 reasons for literacy in the county here in the ’50s and ’60s because she delivered to people things they could read for pleasure. By the time Dotterer retired in 1970, the old Belk building on Main Street in Marshall was a full-scale public library that held more than 16,000 books. Today, the county boasts three modern library locations. Their gracious aisles of books, movies, and audiobooks are as fine as any in the state; their WiFi and computer stations are available to all. Dotterer died in 1993, but the spirit of the bookmobile can still be found in the library’s community spaces, now active with children’s reading groups, after-school programs, book clubs, and even the occasional dog training class. Carolyn Ogburn is a writer living in Madison County.